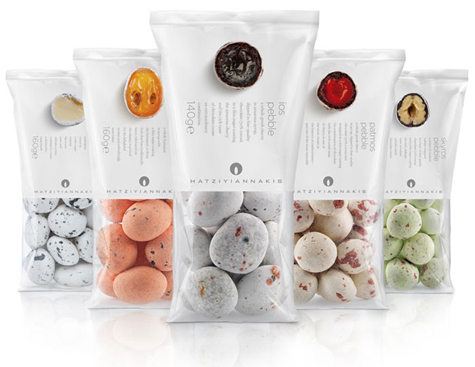 Wonderfully minimal packaging allows the beauty of Hatziyiannakis' ‘pebbles’ - round candy with a core of juicy fruit or nuts and bitter chocolate covered with a thin sugar coating - to shine. The "interior view" (haha) is helpful and enticing. Designed by Mousegraphics. I'm a sucker for both candy and beautiful packaging. Love these - I'll probably have to hunt some down.